The Days of Johann, an agility dog! : Goofy thinnking or a brilliant idea? Goofy thinnking or a brilliant idea? Mum and I are always looking for ways to promote our website - JohannTheDog.com. Why? Because we think it's one of the very best dog shopping sites on the web. Shameless promotion, I know. 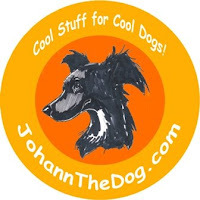 We started JohannTheDog.com as an experiment. First it started as just a fun site while Mum was wondering if she could make a website. Then someone told us about affiliate marketing. That was at a time when Mum was looking for 'stuff' for me when she first rescued me and had lots of trouble finding the types and kinds of products she wanted for me - she's particular! So JohannTheDog.com was born, and we've had loads of fun with it ever since. It's not our primary source of income by any means, just alleviates some of the financial aspects of our agility addiction. We kind of look at it as a hobby, a chance to meet new pups, make new friends, and hopefully bring cool stuff we find to other cool dogs! But we are always open to finding ways to promote the site, more for fun than anything. We were watching some direct response advertisements on TV (you know infomercials) the other day and thought, wouldn't that be fun to do with JohannTheDog.com? We could have pup friends demonstrating products, playing with toys, testing treats, wow it wouldn't be like work at all, more like a fun dog party! Guess all we would need is a direct response agency, and we would be good to go! We could try out an agency we learned about today, Hawthorne Direct. They specialize in DRTV (direct response television), infomercial production, commercial production, and media buying and have done work for Lawn Boy, and other notable companies!